The first thing to say about this fascinating Lego set is that it's not really for kids (the graphics on the big box should tell anyone that it's not aimed youngsters). OK, it's a toy format but someone at the company had the bright idea of using the basic eight stud brick as a stepping stone to explaining contemporary architecture. When you get the box the first thing to do is sort out all the pieces. Unfortunately Lego really didn't provide enough containers to separate them adequately. The box has one large box and two smaller ones and two clear plastic trays divided into sections. Not a problem really, I've used some of those plastic trays and containers that supermarkets sell fruit in. I haven't counted how many different shaped pieces there are, at a guess at least forty to fifty, maybe more and a lot of them are quite small. All the pieces are white and some of the two stud bricks have vertical lines on one side and horizontal on the other. There are two types of clear pieces, one as two stud brick and the other a window. Once you've sorted out the pieces off you go and create that modern home you've dreamed about. The 272 page book explains some basic principles of using the bricks to construct a building but in the end it's down to your imagination. A couple of points occurred to me as I was creating a house, it can't be too big, there aren't enough pieces, my house was eleven inches by six and three inches high though I still had plenty of small pieces over, mostly special shapes. The other point is that there are only a few flat squares so the studs on any base piece not holding a wall can't be covered to give a patio look. A large flat roof will show all the studs. A find this inability not to get a clean finish slightly annoying but the set isn't to create permanent masterpieces (unlike the Lego Architecture sets of modern buildings). The real disappointment with the set was the book. My children had lots of Lego and now the grandchildren play with the bricks and the printed instructions that come with the sets are always brilliantly designed. 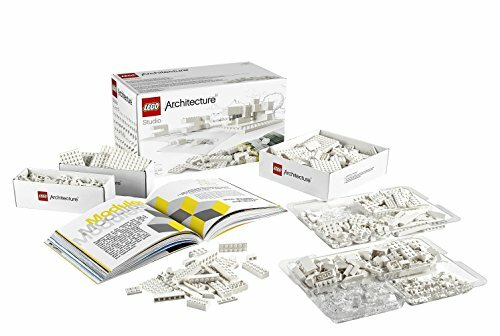 The Architecture book I assume was done outside the company because it has none of the clean typography and straightforward layouts that say Lego. The contents look at the work of six leading architectural firms: REX; Sou Fujimoto; SOM; MAD; Tham & Videgard; Safdie. Each spread is a mixture of text, photos and illustrations explaining various aspects of the buildings these folk have designed. A nice touch were several photos of the architects using the set to explain a building principle. Overall the book is a bit of a visual mess. I think Lego Architecure is a clever idea for lots of creative fun and learning about structures.